One of the most versatile tenors of his generation, Mark Milhofer is as much at home in the music of Rossini as in the repertoire of Monteverdi, Mozart, Strauss or Benjamin Britten. He has built a strong reputation as a masterful interpreter of even the most demanding musical genres. Forthcoming highlights this season include L'Incoronazione di Poppea at the Staatsoper Berlin (cond Diego Fasolis), Eumete or Eumaeus for ROH in a new production of The Return of Ulysses and The Butler for Theater an der Wien in Der Besuch der Alten Dame, directed by Keith Warner. Last season was as busy as ever with successful performances of Nicea in Amor vien dal destino by Steffani and Purcell's King Arthur at the Staatsoper Berlin (cond Jacobs), Lysander in A Midsummer Night's Dream in Valencia and Palermo, the title role in Le Comte Ory in concert in London and the title role in Acteon by Charpentier at the Beaune International Baroque Festival. Also Schneewitchen by Heinz Holliger in Basel, various roles in Luigi Rossi's Orpheus at the Sam Wanamaker Playhouse for ROH, Purcell's The Fairy Queen in Stuttgart (directed by Calixto Bieito), La Rappresentazione (again) in Berlin (available on CD here), Thespis/Mercure in Rameau's Platee for Opera Stuttgart, The Madwoman in Britten's Curlew River for the Presteigne and the Sagra Musicale Umbra Festivals, The Conte d'Almaviva in Il Barbiere di Siviglia for Nationale Reisopera in the Netherlands (available on CD here), role debuts as Nadir in Bizet's Les Pecheurs de Perles for the Daegu Opera Festival in South Korea, Le Comte de Rosillon in Lehar's Die Lustige Witwe for Opera Graz and a return to Cenerentola in Bern. Mark Milhofer was a choral scholar at Magdalen College, Oxford before going on to study at the Guildhall School of Music in London. He made his operatic debut as the Madwoman in Britten's Curlew River, recorded for CD by Koch (available here), but it was the role of Giannetto in British Youth Opera's production of Rossini's La Gazza Ladra that brought him to the attention of public and critics alike. Subsequently invited by the As.Li.Co. Opera Studio in Milan to study in Italy, he worked with Renata Scotto and Leyler Gencer, singing the title role in Pergolesi's newly-discovered La Morte di S. Giuseppe. He went on to sing the role of Fenton in Verdi's Falstaff in several major theatres and made his debut for the Teatro Regio in Parma as Ramiro in Rossini's La Cenerentola, conducted by Alberto Zedda and directed by Pier Luigi Pizzi, launching his international career. A busy concert schedule has included music by Henry Purcell at the Queen Elizabeth Hall and the Wigmore Hall in London with The King's Consort, his Proms début with the same group in Handel's Judas Maccabeus, Bach's St John Passion at St John's, Smith Square with Polyphony, and also in Milan with I Pomeriggi Musicale. He also performed Britten's Serenade for Tenor, Horn and Strings with them and in Parma with Bruno Bartoletti, and again recently with the Orchestra di Santa Cecilia in Rome. He has sung the War Requiem in Christ Church Cathedral, Oxford, under Paul Kildea, Orff's Carmina Burana for the Bournemouth Symphony Orchestra, as well as in St. Etienne, Munich, Zagreb, Parma and Monte Carlo and Rossini's Petite Messe Solennelle for the Aldeburgh Festival. In Great Britain he made his English National Opera debut in Monteverdi's Orfeo, appeared in Purcell's The Indian Queen with the King's Consort, followed by Tamino in Mozart's Die Zauberflöte, Tebaldo in Bellini's I Capuleti e I Montecchi for the Castelward Opera in N.Ireland, Alberto in Rossini's La Gazzetta for Garsington Opera and Dr Fitzpiers in the European première of Stephen Paulus's The Woodlanders. Further significant appearances have included the role of Habbinas in Maderna's Satyricon, directed by Cobelli, Peter Quint in Britten's The Turn of the Screw for the Teatro Manuel in Malta, Rossini's La Scala di Seta in France, conducted by Jean Claude Malgoire, and Almaviva in Dario Fo's highly successful production of Il Barbiere di Siviglia in Holland, Belgium, Germany and Great Britain. More recent appearances include the role of Brighella in Strauss's Ariadne auf Naxos in Bari, Cimarosa's Il Matrimonio Segreto, the Magician in Menotti's The Consul, Don Narciso in Il Turco in Italia, The Novice in Britten's Billy Budd, and Bob Boles in Peter Grimes (available here), all in Turin, Pergolesi's L'Olimpiade in Jesi, Ravenna, Modena and Reggio Emilia and La Cenerentola in Nantes and Angers, a return to the role of The Madwoman in Curlew River in Trento and Pisa, working with Zeffirelli in his production of Pagliacci in Athens and Florence, Telamone in Ercole sul Termodonte by Vivaldi, Prunier in Puccini's La Rondine and the role of the Conte di Bosco Nero in La Vedova Scaltra by Wolf-Ferrari (available on CD and DVD), all three in Venice. 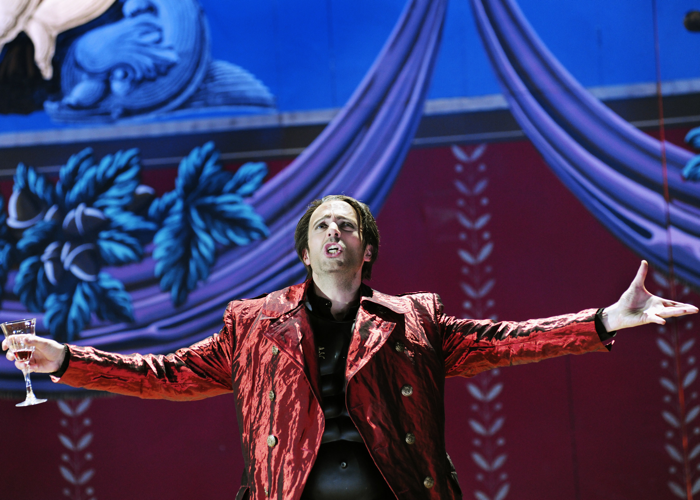 There has also been the title role in Orpheus in the Underworld by Offenbach in Cagliari, Ernesto in Donizetti's Don Pasquale in Belgium, Belmonte in Die Entfuhrung in Salzburg and Rennes (available here), Lysander in A Midsummer's Night Dream in Dublin, Henry Smithers in The Emperor Jones (Gruenberg) in Ancona (cond. Bartoletti) (available here), Giasone in Medea in Corinto (Mayr) in St Gallen (CD available here) and Ferrando in Giorgio Strehler's renowned production of Mozart's Così fan tutte which he has already sung in over 80 performances around the world. Recently Mark has been working a lot at the Grand Théâtre de Genève, where roles have included Linfea in Cavalli's La Calisto, Taxis in Honegger’s Les Aventures du roi Pausole, (available here) Lawyer in Punch and Judy (Birtwistle) and Colin in Rameau's Le Devin du Village. Most recent highlights include Narraboth in Salome at the Teatro Comunale Bologna, (available on DVD here) La Cenerentola at the Stadttheater Bern, Rappresentazione di Anima et di Corpo for the Staatsoper Berlin, and Dr Wangel in the World Première of The Lady from the Sea by the film composer Craig Armstrong for Scottish Opera. Other World Premières include creating the roles of Jean Cocteau in Marcello Panni's The Banquet for the Teatro dell' Opera in Rome and Enrico in Federico II and Tony in The Servant, both by Marco Tutino. Jan in Le Malentendu by Matteo D'Amico in Macerata and Ivan Karamazov in Leggenda by Alessandro Solbiati in Turin.